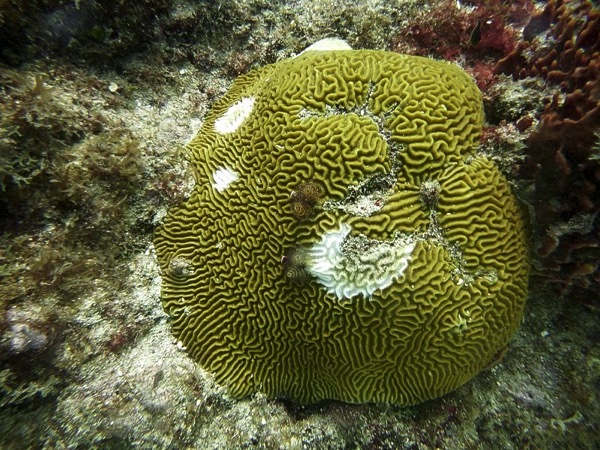 Nature Foundation St. Maarten has recently established the presence of tissue loss disease on several local coral reefs. The disease is relatively new and has been plaguing coral reefs in the Atlantic Basin for the last few months. The coral reef disease manifests itself through the creation of white blotches on stony coral, eventually leading to the loss of tissue and death in the coral colony. The disease affects 20 different species of coral and is able to kill colonies within several weeks or months. This entry was posted in Disease and tagged coral disease. Bookmark the permalink.